Only three examples are recorded of this famous rarity (despite the Stanley Gibbons catalog stating there are only two). The example offered here from the Cunliffe collection was the first to be discovered in 1983 (nearly thirty years after its issuance) by a collector in the United States who found it in a stockbook among his duplicates. 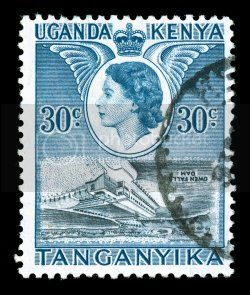 A second example was found in 1992 in a glassine containing common stamps and was auctioned in 1993 by Christies (described also as slight creasing). The third example, sold in September 2002 sale of the Peter Balner Collection of Inverted Centers of the World, was discovered in a mixture of common stamps in 1996 (and it too had a slight crease). The Balner example realized $14,850.00 (including the buyer's premium) against a then catalog value of $11,000.00 (£11,000 in Stanley Gibbons).